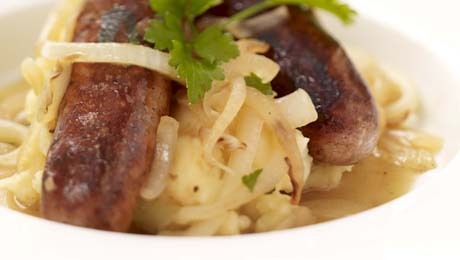 Serve the sausages on the mashed potatoes, covered with a generous helping of onion gravy. Steamed or boiled broccoli works very well with this dish. Peel the potatoes and boil them. Now for the gravy. Heat a large sauce pan with a ½ tablespoon of cooking oil. Add in the sliced onions and allow them to sauté until they are browned. Next add in the plain flour and use this to coat the onions. Don’t worry about the flour browning off because this will give you a nicer colour on the sauce later on. Gradually add the stock at this stage and allow it to come to the boil. Simmer gently for 5-10 minutes, mix in parsley at this stage. Meanwhile, heat a large frying pan with remaining oil, add in the sausages and cook for 3-4 minutes per side until they are browned all over and cooked thoroughly. If you need to keep them warm while waiting for the gravy or potatoes, you can pop them in the oven on a low heat (approx 170C/325F/Gas Mark 3) at this stage for up to 10 minutes. Once the potatoes are boiled, mash them with the butter plus a little salt and pepper. If you have sausages left over chop them up and sauté them with mushrooms and onions, add 4 tablespoons of cream and mix into hot cooked pasta. The family enjoyed this meal its simple and hearty fare although my daughter wouldnt eat onion gravy I just omit this for her and add baked beans for old fashioned dinner.